Nationality: American. Born: George Randolph Crane Scott in Orange, Virginia, 23 January 1903. Education: Attended private school; Georgia Institute of Technology, Atlanta; University of North Carolina, Chapel Hill, degree in engineering; studied acting at Pasadena Playhouse. Family: Married 1) Marianna du Pont Somerville, 1936 (divorced 1939); 2) Patricia Stillman, 1944, one son and one daughter. Career: 1928—film debut in Sharp Shooters ; also worked as voice coach for Gary Cooper and stuntman; some stage work; contract with Paramount, then variety of roles; 1950–55—founding member of Scott-Brown Productions, with Harry Joe Brown; 1956–60—famous series of seven Westerns for Budd Boetticher; 1962—retired. Died: In Los Angeles, 2 March 1987. Fenin, George, and William K. Everson, The Western: From Silents to Cinerama , New York, 1962. Lahue, Kalton C., Riders of the Range , Cranbury, New Jersey, 1973. Parish, James Robert, Great Western Stars , New York, 1976. Crow, Jefferson Brim III, Randolph Scott: The Gentleman from Virginia , Carrollton, Texas, 1987. Crow, Jefferson Brim, Randolph Scott: A Film Biography , Madison, North Carolina, 1994. Scott, C. H., Whatever Happened to Randolph Scott? , Madison, North Carolina, 1994. Scott, C. H., In the Footsteps of the Giant: Randolph Scott's Son Remembers His Father , Savannah, 1996. McCarthy, Todd, obituary in Variety (New York), 4 March 1987. Boetticher, Budd, "Un gentleman," in Cahiers du Cinéma (Paris), April 1987. Obituary in Revue du Cinéma (Paris), May 1987. Dolven, Frank, "The Legacy of Randolph Scott," in Classic Images (Muscatine), September 1989. Dolven, Frank, "Randolph Scott: 'The Best of the Saddle Riders'," in Classic Images (Muscatine), May 1994. Clarke, Gerald, "Cary Grant and Randolph Scott," in Architectural Digest (Los Angeles), April 1996. Randolph Scott had a long career in the movies, beginning during the coming of sound, and ending with his final performance in director Sam Peckinpah's celebrated Western, Ride the High Country , in 1962. Throughout this remarkable 35-year span Scott remained true to one role—the character of the bashful but feared Western hero. But in real life he was neither a Westerner nor a cowboy. Scott was born and bred a Southerner; he attended Georgia Tech and was graduated from the University of North Carolina. He broke into Hollywood through a series of menial jobs, the most illustrious of which was being Gary Cooper's voice coach for a short time. Scott's break came with the revival of the B Western in the 1930s. Quickly he became a minor star, graduating to making Westerns for Paramount. Through the 1930s and 1940s he appeared in an amazing 66 films and rarely worked with distinguished directors (and when he did, it was in mediocre films such as Fritz Lang's Western Union and Rouben Mamoulian's High, Wide, and Handsome ). More often than not Scott was grinding them out under the guiding hand of a Ray Enright or a Henry Hathaway. In the early 1950s (at almost 50 years of age) Scott "overnight" became a star. In the first four years of that decade he made his only appearances in the annual ten list of most popular actors. The Westerns seemed unchanged from the vehicles of the 1940s, save for the addition of color. 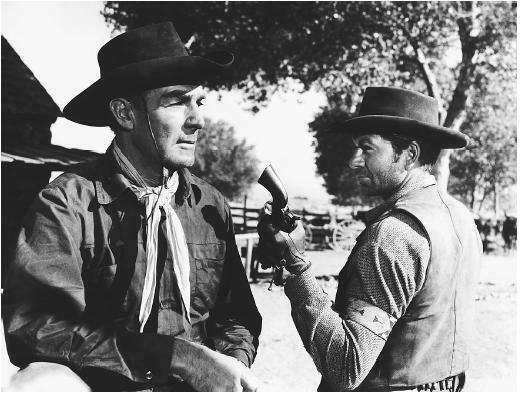 But during the early 1950s the public embraced Randolph Scott's "new" screen persona as dished up in a series of three or four Westerns per year. Based on this newfound popularity, Scott formed his own production company with producer Harry Joe Brown. This enterprise provided Scott with the freedom to create his own Westerns and at the same time become a very wealthy man. In what is now known as the "Ranown" cycle of films, Randolph Scott made his greatest contribution to film history by portraying an aging cowboy in seven films directed by Budd Boetticher, and produced by Scott and Brown. These seven films (from Seven Men from Now in 1956 to Comanche Station in 1960), established, according to noted critic Andrew Sarris, "a new style of the [Western] genre." Film theorist André Bazin called Seven Men from Now "the most intelligent Western I know of . . . and the most beautiful." Scott's final film was Ride the High Country . Many critics consider this tribute to the Western to be director Sam Peckinpah's best film. Randolph Scott retired in 1962 as one of Hollywood's richest men. He made this fortune, estimated to be in the tens of millions of dollars, from the movies plus wise investments in oil wells and real estate. Unlike many of his generation Scott appeared on television only in his old films, not in movies made for television or as a guest star on a series.